Yesterday morning we set off to Home Depot to get cement-fiber siding. This is nice stuff, once installed: it doesn't rot (because it's basically just cement and fiberglass) and it handles like plywood. It is made of cement, though, which means it is heavy as hell and requires a concrete saw blade to cut properly, and when you cut it copious amounts of silica dust billow around you (silica dust causes white lung disease, so face masks or the ability to hold your breath for several minutes are in order). Anyway, we went to Home Depot and rented a truck there, which was actually a very fine experience. The truck rental works like this: you go arrange the rental with a driver's license, credit card, and proof of insurance. You are given the keys and a piece of paper, after which you can get all your stuff and load the truck, at which point you pop in and set the clock for your rental (this is good because checking out at Home Depot on a weekend invariably takes an hour alone). The truck cost $20 for one hour and 15 minutes, and we had to return it with a full tank (not difficult because our round trip was 4 miles). Getting the actual siding was not terribly fun as it involved digging through a pile of siding that had sustained large and various dings, gashes, and dents to find intact pieces. And the next person who comes along will have to dig more, because the Home Depot guys will just stack the rejects on top of the pile again for the next person. If they had any sense they would sell the rejects for 1/2 off and get them out of the store, but they'd rather not. We got the siding home, returned the truck, and spent a few hours on the Accordion Room, then came outside for a little refreshing Chicken House work. 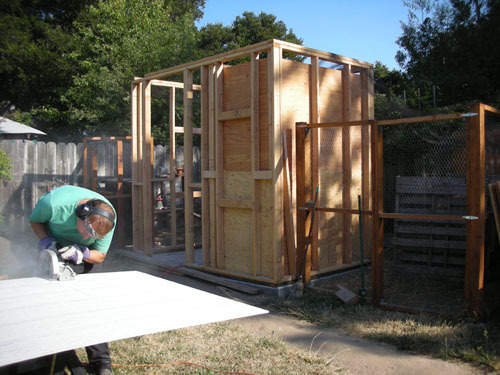 We started by going around three sides putting in blocking and the framing around the windows. This helped tighten up the wobbliness in the building, but nothing like the way triangulation will. So we hauled a piece of the siding out back, measured, and cut it. Then we spent ten minutes climbing over compost piles and getting tangled in aviary netting while wrestling it into place. Then in a few minutes of nailing we managed to destroy that piece of siding (nail gun pressure too high, bad positioning, and so on). So we pulled it off, set it aside, and got another piece, while pointedly not thinking about the work involved in buying a single piece of siding, including and especially the inevitable dig through the pile for a single piece of siding that has not had a close encounter with a forklift blade. But we prevailed. We got siding on the bottom of two sides, then the top was really easy because you just set it on the bottom and nail it into place. And now we have a little room that feels like a little room. We just need to cut the windows out. On the other side, there's the chickens' room, which they have been playing in all week (they kick stuff in there from the compost then dig around in it). It could also use some windows. 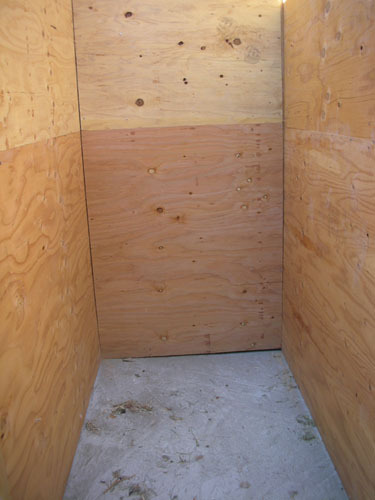 And here's an important lesson about the nail gun and cement siding: make sure nobody is standing on the other side of the wall where you are nailing, because without wood to stop the nail it will go through like a bullet. The nail that caused this hole went all the way across the lawn and pinged on the side of the metal shed, twenty feet away. 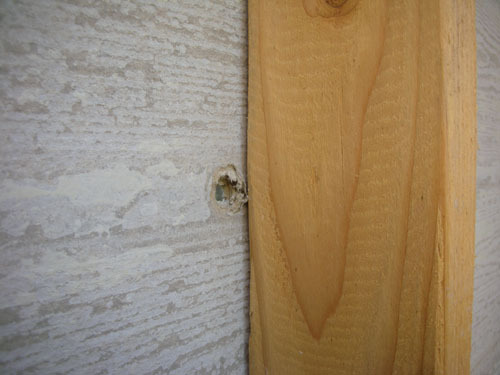 Fortunately, the hole happened on the inside of the window, so that siding is going to be cut away anyway. More fortunately, nobody was anywhere near that part of the yard when it happened. And at the end of the day, we had slightly more shed. The nice part here is that we were able to take down the temporary chickenwire fence we had up over the area between the gates, because now there are walls to keep the chickens in all parts of their yard. And if you're wondering what this is going to look like when it's done, here's a bit of a sketch to show the roof and door and so forth. The siding doesn't come all the way to the top, but there will be a return on the roof making a soffit that covers the gap. 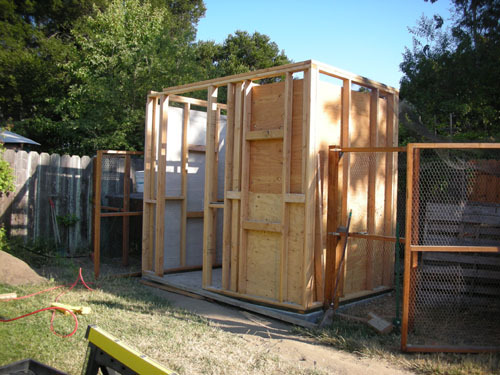 We're already thinking the chickens won't use all their vertical space, and we might appropriate some of it for a large storage shelf above window height (though what we might store on that shelf is not clear). And now, on to the Accordion Room floor. 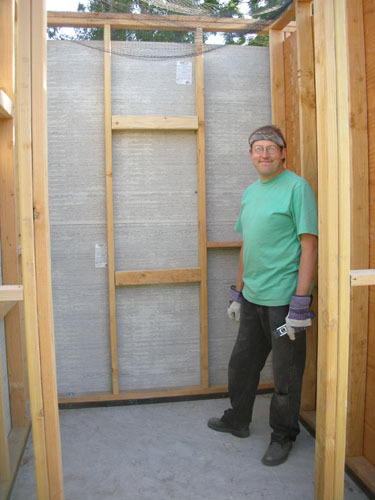 it's not "concrete-fiber" siding..it's cement-fiber siding. Looks great! It's good to have the "artist's rendering" to see better what it will look like later. Maybe you could keep chicken feed on those shelves? In critter-proof bins, of course. Thanks, noearch; I would never have known that if you had not corrected what was obviously a mis-type. Kitt, I think six feet up might be a trifle high to lift sacks of chicken feed. I'm thinking that tomato cages (which I use for protecting new shrubs) might work there, though; light enough and infrequently accessed enough. Another good thing would be to put pairs of pegs on the wall in the coop and you can hang compost turning and chicken-cleaning-up-after tools on the pegs. 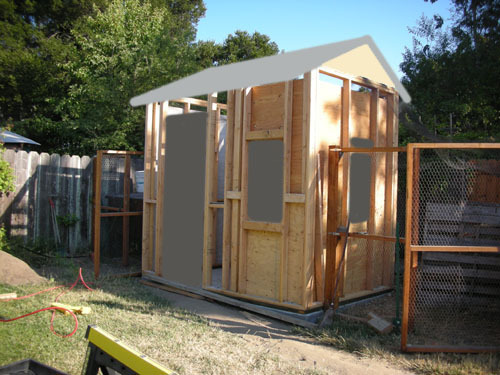 I hope you paint the coop a festive and silly color. I was planning to hang garden/coop tools in the shed portion on pegboard. I'm pretty sure the chickens would mess all over anything I left in the chicken side. As for festive colours, I was thinking of leaving it light grey, like the house. But if it looks too large I may go for a darker colour. Not soon, though; we have a lot of other projects in the works that take priority.